Interview between Fred Capell and Marvin Pierce about the benefits of using Pierce’s Cow Dog Cattle Gathering Services. kept the dog out of the pastures. but also at home with the obedience training I do with Diego. 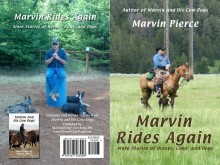 Marvin, I want to say thanks once again for your sharing your knowledge and having such patience with me and RedDog. Today’s the first day after the clinic and he’s certainly shown that he’s learned his lessons. He’s earned a lot of of “Good Dog” praises already! I’m looking forward to the next time we meet and that you’ll be impressed with this particular Red Heeler’s improvement! 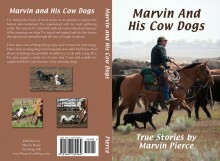 Marvin Pierce and his cow dogs have moved cattle for our farm for the last four years. I am pleased to be able to utilize and recommend his services. 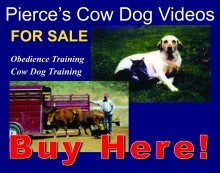 He and his cow dogs are efficient, humane and professional in his approach to moving animals that we have purchased. He and his cow dogs have also assisted me at capturing loose cattle and accomplished this in a efficient and timely manner in order to reduce the trauma to the animals and minimize damage to property. I cannot say enough about Marvin Pierce’s responsiveness and willing to work with his customers within their needs and timeframes. Interview between Rick Beaudry and Marvin Pierce about the benefits of using a bred, raised and trained Pierce’s Cow Dog to work and gather cattle. Maggie is a Cattle Master x Hangin’ Tree Cowdog bred by Pierce’s Cow Dogs and trained with the help of Marvin Pierce.